Surf 309 is a corner unit and has the most spectacular/amazing view; from the living room, dining room and master bed room. But, the furnishings are out dated and below standard. The Master Bedroom Bed is WAY to small for two people, and Mattress was horrible, as were the mattresses on the beds in the second bedroom, which is located on the back side of the condo, getting no sun light. The TV's, and there were two, were somehow connected and you had to watch the same channel on both, even though one was in the living room and the other in the master bedroom. There were very limited channels to watch as well. If you do not speak Spanish you are just out of luck for watching TV. We were there during the Super Bowl 2017 and got none of the commercials, which, in my opinion, is the best part of the Super Bowl. The kitchen needs better cooking utensils; for example: the pots and pans were extremely out dated, newer glasses should replace the old ones, the dishes need to be replaced as they were all chipped. The orange color on the main wall is dark orange and way wrong for the unit. There was a horrible smell in all of the bathrooms, apparently, the smell was a sewage back up. The hot tub is outdated and does not operate. The Rugs on the floor need to be replaced. The wicker furniture on the patio had holes where you are suppose sit. And the sofa in the living area needs to be replaced with a updated sofa. The lamps were old and literally falling apart. The water in the unit does not stay hot for a very long time. You can barely take a shower before it is cold again. In my opinion, this unit need a lot of attention to be worth the cost, of which, was paid to stay there. With the view being on the top of the list; until some of the above items are updated and/or repaired, I can not recommend staying in this Unit. Thank you so much for your comments. Surf 309 has a great location within the complex, excellent views and lots of extra space. I'm sorry the condo didn't met your expectations. A queen bed is usually big enough for 2 people but we have passed this and all your comments regarding decoration to the Owner. I'm sorry you weren't able to watch the Super Bowl comfortably, being in Mexico most of the commercials are not allowed to be transmitted out of USA, plus the fact that your are in Mexico with a Mexican satellite company makes it very hard to have the same exiting experience that if you were in USA. However most of the popular channels are able to be set in English through the remote. We don't advertise the hot tub as it had gone through lots of repairs and the hard water in Mexico continues damaging it very often. Any other problem regarding maintenance we have passed it to the property manager on site. Thank you so much for your comments, they are very important for us!! Surf 309 has the best location in the complex. As you mention the view is stunning. The complex has great common areas, great pool and the best location in town. Please do not hesitate to contact us for a future reservation!! This was our 2nd year in a row staying at this exact unit and overall we really love it. The location is the best in Playa, a block from the Quinta Avenida, and walking distance to everything. The view from the balcony is exquisite. All the amenities and supplies you could need are provided or very easy to get. The pool is gorgeous. Security is very visible, we even left our door open one night by accident, and he let us know while he was doing the rounds. Now, the negatives. Neither year we've been there has the hottub worked. Not that big of a deal since it is usually so hot in Playa, but I do think its a bit misleading to advertise a hottub when really it is not functional. Last year they actually let us know before we arrived that it was not working and they gave us a partial refund. This year, we tried turning it on when we arrived, but absolutely nothing would happen. We reported it, and someone was supposed to be sent out, but I don't think they ever came. We tried turning it on a couple of other times throughout the trip, but it would never respond at all. The washer and dryer in the unit are not very functional. We didn't have any problems last year, but this year they just didn't do their job. I had some deodorant marks on a t-shirt that didn't come out, neither did the cologne smell from my husbands shirts, neither did the sunscreen that got on his trunks. The dryer works ok, it just takes a really long time to dry the load. The biggest negative is the smell in the master bathroom. I had read reviews of this last year before our trip, but we arrived and there was no issue at all. This year, completely different story. That bathroom smelled like sewage our entire stay. I don't know if other units in the property have this same issue, as the 2nd bedroom and the half bath did not have this smell, so it may be an issue with the specific plumbing in that room only. Overall, I would recommend this property and we will likely stay here whenever we go back to Playa. But if you really need to be able to thoroughly wash your clothes, or if anyone is sensitive to bad smells, I would probably consider a different unit. Thank you so much for taking the time to send us your feedback. Surf 309 is a beautiful unit, which one of the best locations in the complex and a privileged location in Playa del Carmen. Regarding the issues you experienced during your stay, jacuzzis here in Mexico are very hard to keep functional due to the humidity, rust and hard water full of minerals that affect all the system. The Property Manager has tried to keep it functional as much as possible, because we cannot guaranty it will be working all year around we do not advertise the jacuzzi anymore, it is just advertised as a Plunge pool. The smell is a very serious problem that building has experience due to the bad sewage system here in Playa, however they are continuously working on it to avoid the smell issue to be recurrent. The washer and dryer is functional and this is the first time we have received a complain about it, but we will pass your comments to Maintenance Staff so they can check it and verify everything is ok.
We just got back from a fantastic stay here! This is the ideal vacation spot, serious oceanfront. You won’t be distracted by emails and work stuff while you’re here unless you choose to be. Styled with a modern vibe, all the amenties, and ocean views everywhere, you can’t help but immediately unwind. Master bedroom was comfortable with an excellent ensuite including soaker tub and walk-in glass shower. My favourite feature was the large wraparound patio. The moment my husband and I walked onto the balcony we felt it… instant ‘chill mode’. Calming breezes, the mesmerizing ocean lullaby, palm trees lining the balcony perfectly giving us that little extra privacy we wanted, and wow, what an incredible view!! Now this is oceanfront. We literally would curl up on that couch and just fall asleep at night… truly relaxing. By the end of our stay we almost felt we had gone away to the spa for the weekend, we were like jello, throroughly pampered and truly relaxed. Enjoyed everything about this place,… they didn’t miss a thing. Want to thank Neomi and Yael who very helpful and accommodating. Will definitely return. The pictures and video on-line are must have been taken when the furnishings and condo were new. If this was a Chain hotel, these furnishings would not be there. Broken and dirty outdoor patio couch, torn dining room chairs, bed mattress in 2nd bedroom is old and needed to be replaced. All bed covers are old and need replacing. Broken microwave and hot tub....neither worked for the 7-days we were there. The condo is overall great, great view and rap-around balcony. The view is priceless. The master bedroom has a view of the pool and beach, but the second bedroom is like a cave. It has a glass block window to the lighted hallway. I would stay here again, but by then I would hope they do the repairs on the hot tub and buy new furnishing. The management company was very attentive and housekeeping did a good job. I am glad that you enjoyed your stay and gave us 4 stars! El Faro is a fantastic place to stay and Surf 309 has the best view. The patio furniture was in the process of being renewed. The microwave and hot tub are in working order. The interior has also undergone some minor touch ups that the unit needed and always gets all thorough the year. We look forward to your next stay in this beautiful ocean front condo! Playa del Carmen est mondialement célèbre pour ses plages de sable blanc, turquoise des Caraïbes l'eau, boutiques et restaurants sur la célèbre 5ème avenue de Playa et vie nocturne animée. Les ruines archéologiques de Chichen-Itza, Tulum et Koba sont une courte distance en voiture, et les superbes Xel Ha et Xcaret parcs éco sont à proximité ainsi. Profitez du parcours de golf PGA Mayakoba ou d'autres cours à proximité. La région est littéralement remplie d'activités jour et nuit. 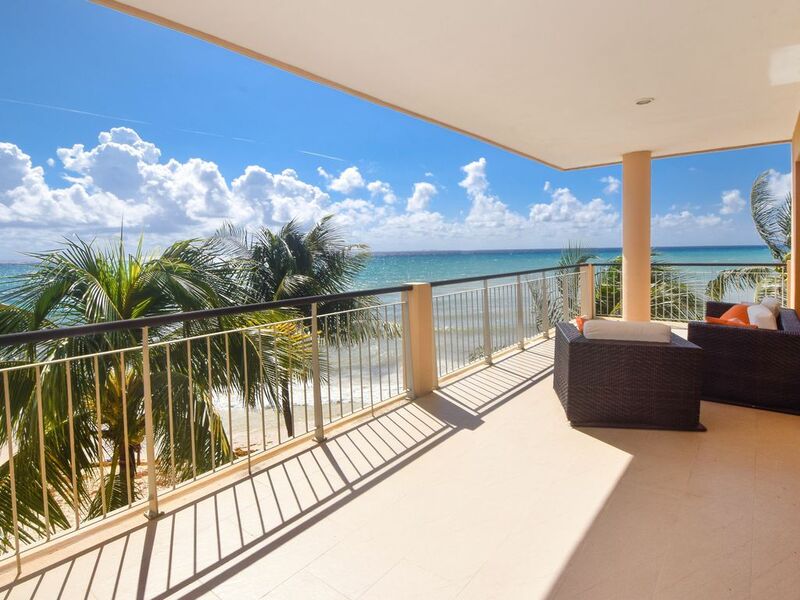 Ou, tout simplement se détendre sur votre terrasse en bord de mer ou sur les magnifiques plages de sable blanc de Playa del Carmen.